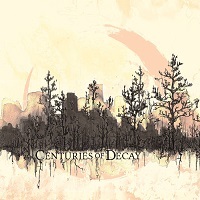 CENTURIES OF DECAY is a relatively new band based out of Toronto, Canada. The quartet considers themselves to be an Extreme Metal act, but with various elements of other genres of metal, including Progressive. Their eponymous debut album is presented here in 2017, and contains eight tracks. A short instrumental “Intro” leads into the ten-minute title track. Sirens whistle in the background, and an ominous feeling builds…don’t look over your shoulder. “Centuries of Decay” opens tenuously, with some soft, clean guitar. A thunderous guitar riff ensues shortly thereafter, and soon harmonies build, as Derrick lays down the double bass meter for the charge. Sorrowful mourns of the vocals are reflected in the lyrics, “desolate metropolis…desolate skyline…disintegrate…buried beneath the sands of time…erased from history.” After the fairly depressing opener, “Architects” rolls in with some more might and power. It seems to reference the “prison” mankind has created for himself, living inside structures, “imprisoning your mind and soul within the endless rows of towers.” The sound shifts around nimbly, with some great guitar work, and some truly outstanding drumming that utilizes many techniques in establishing the rhythm. “Rise” is a six-minute scorcher that moves along quickly with some challenging shifts and a lot of presence from the guitars. Again, I have to point out that drummer Derrick really holds the key to the rhythmic changes here which are phenomenal. The twelve-minute opus “Demise” caps off the album. The dejected, defeated blackness is on full display here. “All my hatred, all my lies, won’t save me from my own demise…I’ve given all and nothing gained…I cast myself into the flames.” Like a wooly mammoth lumbering through planes of ice and snow, before being consumed by a winter storm, it’s the last breath of life to an album themed with all the elements of doom and foreboding that it could be. This is a strong debut for the band and they have laid their vision for their craft nicely. They can only improve with more time together, and this is a band to keep an eye on.